So picture this scenario: Nokia has its global conference and developer event -- the aptly-named Nokia World -- scheduled and set in stone for months. HTC swoops in just weeks ahead of time and schedules a conflicting press event in the same city (which we're covering in just a few moments). You might imagine there's a little bit of bad blood there, yeah? Well, Nokia's taken it to the next level here, sending a phalanx of young folks with giant red balloons reading "I know where I'm going with Nokia's Ovi Maps" to stand directly outside the entrance to HTC's event. We know where we're going, too, Nokia... and it's HTC. Sorry! We'll be back to Nokia World soon, we promise. 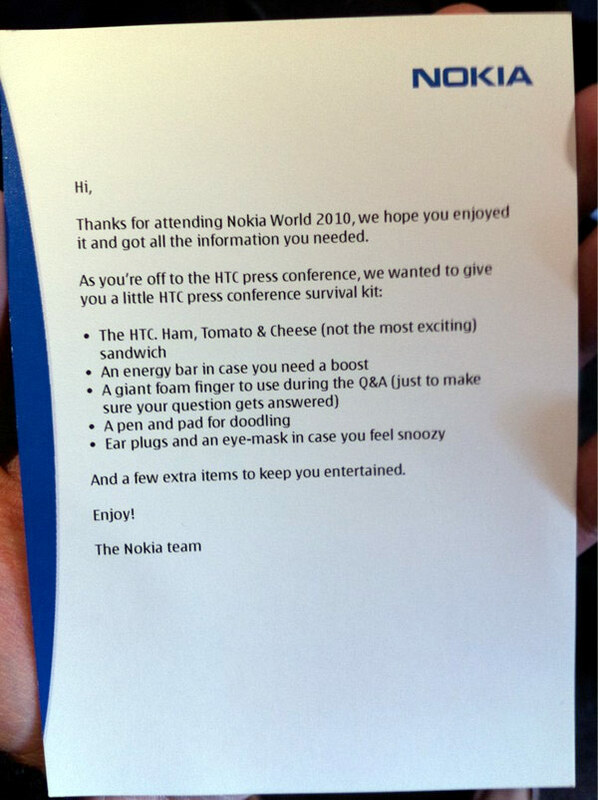 Update: Oh, and Nokia handed out "HTC press conference survival kits," too. Pitiful, really. Peek it after the break. Update 2: We spoke with an HTC representative who told us that the company had originally planned to hold its launch on the 14th before Nokia had announced its dates for Nokia World -- and when it found out about the dates, it switched to the 15th to make room for Nokia's announcements. Seems fair to us.